Accepta 8105 is an eco-friendly, multi-component oxidising biocide scientifically formulated using a stable combination of 5% hydrogen peroxide (H2O2) and silver (Ag) ions to create a highly effective sanitising solution. Accepta 8105 is intrinsically safe and specifically formulated for applications where handling and application risks need to be minimised. It is particularly appropriate where shipping and handling issues preclude the use of other forms of oxidising biocide. This synergistic combination between the hydrogen peroxide and silver is so effective that it creates a biocide twenty times more powerful than that of hydrogen peroxide alone. Accepta 8105 represents a new generation of clean, safe, environmentally friendly biocides for the effective control of micro-pathogens including Legionella, E.Coli, Influenza A and B, Pseudomonas, Campylobacter, Salmonella, MRSA, VRE and other bacterial, viral and fungal infections, on hard surfaces and in water systems. Accepta 8105, being a highly effective super sanitiser, its applications are numerous making it ideal for use in hospitals, veterinary surgeries, food production facilities, farms, hotels, industrial and office buildings, schools, swimming pools and spa’s. 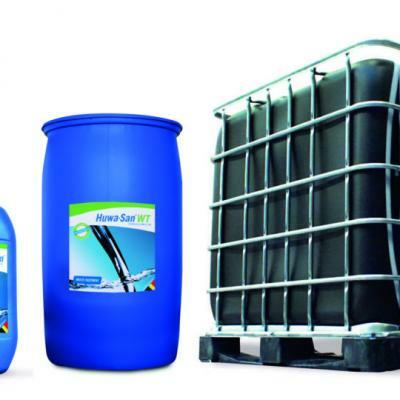 Accepta 8105 also offers a unique and complete bio-security solution for poultry, fruit and vegetable, beverage and meat and fish production. Accepta 8105 is a high performance, broad spectrum biocide based on an innovative formulation of hydrogen peroxide (H2O2) and silver (Ag). Accepta 8105 is effective against all kinds of bacteria, viruses, yeasts, moulds and spore formers. It is also very effective against Legionella pneumophila, the causative organism for Legionnaires’ disease. Accepta 8105 is considered to be environmentally friendly as it is practically 100% degradable under use conditions, simply breaking down to leave water and oxygen. Hydrogen peroxide is a strong oxidising agent, setting free the molecule oxygen (nascent oxygen) which then oxidises the enzymatic system of micro-organisms. Silver interferes with the metabolic basic functions of the bacteria (enzymes) or acts on their diaphragm structure (oligodynamy). Both elements act in the same direction and enhance their benefits (potential synergism) as a powerful disinfectant. The hydrogen peroxide content of Accepta 8105 is 5%. A 50% version of this product is also available as Accepta 8101. Breweries, producers and bottlers of mineral water, soft drinks, fruit juices, must/cider, wine industry, etc. Milk, cheese, butter, dairy products like yoghurt, etc. Canning factories, prepared food producers, butchers, abattoirs, mills, fish processing, chocolate factories, edible oil/margarine/shortening factories, pasta and farinaceous producers, bakeries, food packing, etc. Breeding establishments, such as poultry/rabbits/guinea pigs, disinfection of stalls and stables, animal processing, fish farms, ponds with shrimps, mussels and oysters, terrariums, aquariums, zoos. Hors sol production, plantations. Pre- and post harvesting disinfection. Disinfection of humidifiers, elimination of algae, cooling towers, air-conditioning equipment. Disinfection of surfaces, instruments, laundry, etc. Important note – this product must NOT be used for the treatment of water feeding renal dialysis (or similar) units. Hotels, restaurants, canteens, households, storage and warehouses, schools, universities, gymnasiums, showers, lockers, toilets, etc. Disinfection of surfaces and medical equipment, implements and instruments, humidifiers, sanitation. Chemical, pharmaceutical and cosmetic laboratories. Disinfection of surfaces and equipment in production sites for medicines, perfumes, essences, dyes, photo equipment, etc. Travel (drinking water, sanitation), camping, hobbies, tanks for drinking water and waste water equipment (caravans, ships, etc.) and vessels. Disinfection of beaches. Disinfection of baths, showers, WC’s, mirrors, glass, carpets, etc. Private swimming pools, public swimming pools, hotel and spa baths, whirlpools, sauna baths, fitness centres, solariums, etc. Treatment of drinking water, disinfection of cisterns, tanks, pipes, drinking fountains, etc. ; long-term conservation of emergency water supplies (e.g. military, civil defence). Sewage treatment plants (public and industrial). Bio- degradability: This product is non-polluting. Its main constituent, hydrogen peroxide, does not pollute sewage water as only water and oxygen (2 H2O2 = 2 H2O + O2) – in other words non-polluting by-products – result when it breaks down. Dosage rates for Accepta 8105 are application specific. Please contact the Accepta technical team for additional information.